Travel Update- Monday, September 15th- We made it! Today I’m with my lovely family in Zambia at Kafue National Park, the second largest national park in the world. Lions, and leopards, and cheetas, oh my! Today’s guest blog post comes from my friend, Kim Bamberg, Junebug’s Art Director extraordinaire, and one of the sweetest people you’re ever likely to meet. Kim works with all of the spectacular images that are generously submitted to our site, and has an eagle eye for beauty. Today, I’ve asked her to share ten of her favorite shots from Junebug member photographers. I know you’ll love them! As Junebug’s Art Director I have the greatest job in the world, but I have to say that coming up with only ten photos I adore has been pretty tough. Here are my favorites of the moment (by the time I’ve posted this I’ll probably have chosen 100 more!) The first two were taken by my Junebug partners, Christy and Blair, of Postive Light Photography, the rest are from John and Joseph Hong, Grace and Hun Kim, Jim Garner, John Chin, Anglea Burke and Ashley Delatour, and I’ve even chosen one from my husband, Adam, who is my partner at La Vie Photography. I love the photos above and below from Positive Light Photography, because they tell an emotional story of love and connection. You can feel the joy of the couple pictured above, see how stylish they are, and get a glimpse of what it was like to be there with them. In the photo below you can feel the vulnerability, gratitude, and love of the bride. I think that the ability to transport the viewer to another time and place is what great photojournalism is all about. In the following two photos, John and Joseph Hong capture the important details of the day and add a little magic of their own. Notice the couple’s reflection in the groom’s ring (genius!) and the texture and beauty of the bouquet below, I feel like I can smell and touch it from where I’m sitting. When it comes to great portraits, it’s all about capturing authentic personalities. I love the way the blue eyed bride, captured by Jim Garner, looks at the camera completely at peace and content in the arms of her groom. The following photo from GH Kim, clearly shows a couple joyously in love and in their own moment. In the last few years wedding photographers have gotten increasingly creative at producing fun, artistic group portraits. It’s been a pleasure to see how many of the Junebug Member photographers have led the way. Take a look at how gorgeous and fashionable the photo below is, taken by GH Kim. It looks like it came straight out of Vanity Fair magazine! The next one, from Yours by John, is a playful take on a classic group portrait. I love the somewhat traditional shape combined with the spontaneous moment. Last but not least, I am always amazed by what famous photographer, Henri Cartier-Bresson, called the “decisive moment.” That milisecond where magic happens. Obviously, no photographer could have ever planned to take the photos below. The first one was taken by Jim Garner, who always seems to be at the right place at the right time, and the last one was taken by my husband, Adam, at the height of a Jewish Hora dance. The opportunity to work with Adam (and to know he is busy taking shots like these) is one of the things I am most grateful for in my life. When it comes down to it, I just adore looking at fabulous images. Send me your favorite photos, or submit your Real Wedding for consideration on Junebug. I’d love to see how your photographer captured your big day! 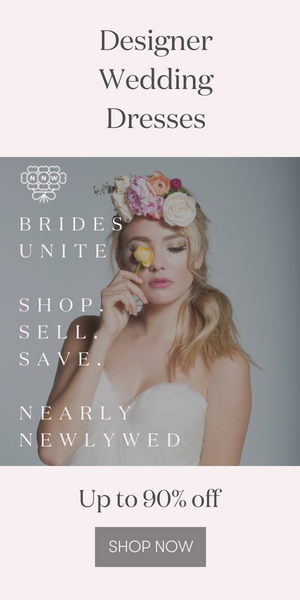 Junebug’s ALL NEW Bridal Market Fashion Report! The photos are my favorite part of this website (I might be a bit bias)… I loooove the photo with the rings and I also the photo of the lightening!! Excellent picks!! Beautiful pictures! Loved it. They were all so great. I loved looking at these photos!! They make me want to get married all over again!! The imagery on Junebug is in a class of it’s own. Junebug is full of such incredible photography. I am honored to be included in your favorite shots. Thank you for sharing! Wowwwww! What stunning photos. Look and learn from someone who is truly on top of their profession!